While the best hard drives will come nowhere close to being faster than the best SSDs, they’re so much cheaper and more capacious. Sure, you won’t find them in the best Ultrabook, but a hard drive can be useful as an extra drive or even an external measure – especially if you have a lot of data to back up. If you’re looking for the best hard drive for your needs, you’ll have to consider what you plan to do with it. If you’re looking for the best hard drive for your Xbox One or PS4, you’ll want a 2.5-inch drive or even an external hard drive. However, if you’re rocking one of the best gaming PCs, and you just want all the space you can get, a 3.5-inch drive is what you want. It’s a lot to think about, but we went ahead and gathered up the best hard drives to help you out. It’s almost impossible to talk about hard drives without mentioning Seagate’s BarraCuda lineup – it’s a force to be reckoned with. And, it’s not hard to see why, Seagate BarraCuda drives offer a great gigabyte-per-dollar ratio and speed benefits to top it off. The 2TB model hits a sweet spot by balancing high performance and affordability. Since this drive combines 7,200rpm platters and high density data, computers outfitted with this drive will be able to read data extraordinarily fast. Even if its laptops aren’t as popular as they used to be, Toshiba is still a huge name in computing, and has a lot to offer. When it comes to the best hard drives, the Toshiba X300 is a high-capacity, high-performance champ worth taking a look at. The X300 drives boast great gigabyte-to-dollar value without sacrificing on performance. These drives all spin at 7,200 rpm and include 128MB of cache for higher speeds. The only downside is the warranty only lasts two years, which feels short for a drive meant to store so much important data. When it comes to PC gaming, it’s better to be fast than capacious. So, if you’ve been resisting the allure of an SSD, and looking to kick it old school with one of the best hard drives, the WD VelociRaptor should be up your alley. Not only does this drive have a whopping 10,000 rpm spin speed, but you’re going to want to pay attention to it. With capacities up to 1TB, the VelociRaptor drives are ready to store large game libraries, and the super fast platters will help your games launch and load quickly. Western Digital offers a solid bargain with its line of WD Blue hard drives. With a wide variety of storage options from a small 500GB to a capacious 6TB, the WD Blue is a viable pick for almost any type of PC build that’s sticking to a budget. The best value comes from the larger drives – they’ll give you much more storage per dollar spent. And, if you’re looking for a bit more speed, there are also 7,200rpm models available that don’t come with too much of a price hike. SSDs are all the rage these days, and it’s not hard to see why. 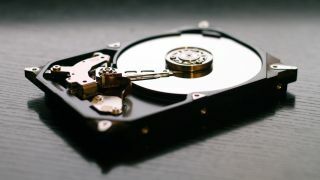 But if you need a lot of fast storage, hybrid hard drives – which contain a small amount of solid state storage to bump of their speed – are a great option. The SeaGate FireCuda is the best hybrid drive out there, it can fit up to 2TB of data, and then its 8GB of solid state cache storage learns and stores the data you use most to access it faster. That speed boost is even sweeter when you consider this drive spins at a fresh 7,200rpm. With its 5-year warranty and approachable price tag, it’s easy to see why it’s one of the best hard drives out there. It’s a little unfortunate that the Seagate IronWolf NAS drives come at a premium, but they aren’t priced much more expensively than a standard hard drive at their capacity. However, their native NAS optimization makes that premium totally worth it. These drives are capable of running at a fast 7,200rpm spin rate 24/7 without having to worry about drive failure. Really, if you have one of the best NAS devices for your business or home, the Seagate IronWolf NAS really is your best bet. Upgrading the storage in a laptop can be tough, since the hard drives are much smaller. There aren’t a lot of impressive 2.5-inch hard drives, as anything fast comes with a serious markup, but Seagate’s 2.5-inch FireCuda hybrid drive strikes a nice balance. It offers an easy way to add loads of storage to a laptop while also giving it a speed boost thanks to 8GB of flash storage. A five-year warranty on the drive will also help ensure it lasts a long time. A lot of people seem to think that the best hard drives are ancient and dead technology in 2019. However, with devices like the G-Technology G-Drive, you can show the naysayers in your life that spinning disks have their own place in the future. Not only does this external hard drive offer huge amounts of storage – up to 10 TB – but thanks to Thunderbolt 3 compatibility, it can even charge your laptop while you work. If you have a MacBook Pro, it’s hard to think of a better work companion.